Rated PG-13 Running time: 97 Mins. I knew “Mustang” was a great movie when I first saw it at the Cannes Film Festival in May, without benefit of English subtitles. 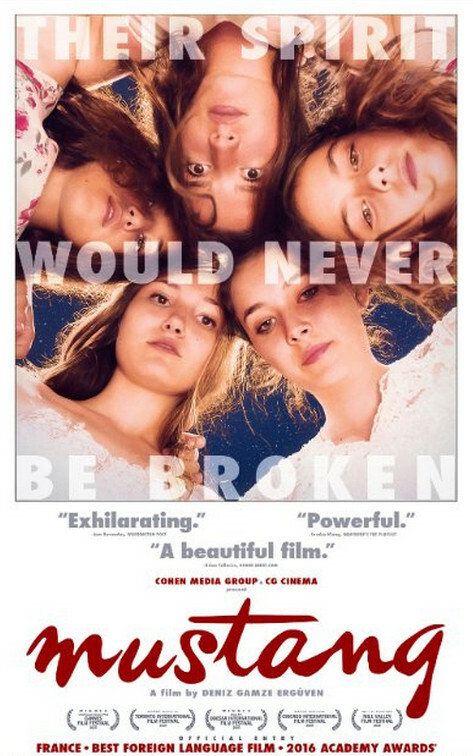 Although the film, about five adolescent sisters coming of age in a small town on the Black Sea, was entirely in Turkish, it was so dynamic, legible and visually rich that I understood every moment. That “Mustang” is such a clear, well-crafted film is all the more exhilarating because it’s the first film by its co-writer and director, Deniz Gamze Erguven. Along with “Son of Saul,” another Cannes discovery and feature debut that opens today, “Mustang” confirms that sensitive, humanist, deeply immersive filmmaking remains alive and well in a world bursting with vital stories and indelible characters. In this case, the story has to do with the sexual anxiety and repressive fears that inform so much of Turkish culture, where women are expected to marry young (and, it goes without saying, as virgins). The smart, headstrong girls who try with varying degrees of success to buck that trend emerge as unforgettable embodiments of both a painfully archaic patriarchal system and its flip side, a self-determined future that’s achievable if women feel empowered enough to seize it. The avatar of that pivot is Lale (Gunes Sensoy), a gutsy, watchful girl of about 10, who, as the youngest of the siblings, closely observes their victories and mistakes in order to craft her own, fiercely independent path. “Mustang” begins on the last day of school before summer break, when Lale and her sisters go for an impromptu swim with some boys, cavorting in the waves with their school uniforms still on. When a neighbor spies their antics and reports them to the girls’ grandmother and uncle (with whom they’ve lived since their parents died), Lale and her sisters are put on lockdown, their uncle making the house more fortress-like after each attempt to escape its suffocating boredom and quietude. While the girls’ female relatives try to tutor them in the domestic arts of cooking and sewing, Lale dreams of attending a soccer match several miles away; later, when one of her sisters is subjected to an arranged marriage within minutes of meeting her would-be husband, Lale realizes that the stakes are higher than rooting for her favorite team. Channeling the dreamy, gauzily abstracted style of Sofia Coppola’s “Virgin Suicides,” as well as classic jailbreak thrillers and fairy tales, Erguven conjures the hermetic, coded world of sisters who enjoy the enmeshed, spontaneous intimacy of nuzzling puppies. Working from a script she wrote with French filmmaker Alice Winocour, Erguven brilliantly evokes the sensual world of burgeoning womanhood, not just as a matter of sexuality, but also of an entire gamut of sensations, physical and emotional. Drowning in the torpor of confinement and enforced domesticity, Lale and her sisters cope by means ranging from grudging acceptance to rebellion (with a tragic interlude in between). What’s at stake, as these young women struggle and strategize against the sexual paranoia that surrounds them, is nothing less than female desire itself. For all of the outrage that “Mustang” inspires by its depiction of sexist oppression, it’s still enormously pleasurable to watch, in part because of its enchanting setting (it was filmed in the northern Turkish town of Inebolu) and Warren Ellis’s thoughtful score, but mostly because of Sensoy and her four equally beguiling co-stars. Among Erguven’s finest achievements with “Mustang” is casting such mesmerizing actresses to play characters who would be just as at home in a Chekhov production or an Instagram-worthy fashion shoot. With their tumbling manes of wavy hair, self-possessed stares and languid, untamed beauty, they more than live up to “Mustang’s” title — which doesn’t refer to anything literal but instead to the strong, spirited, stunningly graceful creatures at the story’s heart. That turns out to be yet another perfect choice for a movie that never puts a foot wrong. A DISCUSSION FOLLOWS EVERY FILM!